1. Cut the meat into chunks. Season, sprinkle with half the sumac and thread onto 4 short skewers. Warm a frying pan over a high heat Fry for 5-6 minutes, turning often, until browned and cooked through. 2. Dice the cucumber and mix with the lime zest, half the juice, oil and parsley leaves. Mix the tahini with the remaining lime juice and 1 tbsp water, then season. 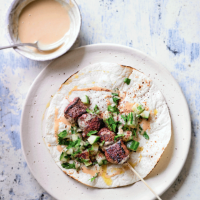 Serve both with the skewers, sprinkled with the remaining sumac. Delicious with warm flatbread. This recipe was first published in Thu Jun 29 09:22:00 BST 2017.